A group of Herring Gulls and Ring-billed Gulls at Lake County Fairground, Libertyville, Illinois, just north of Chicago. 18 February 2014. 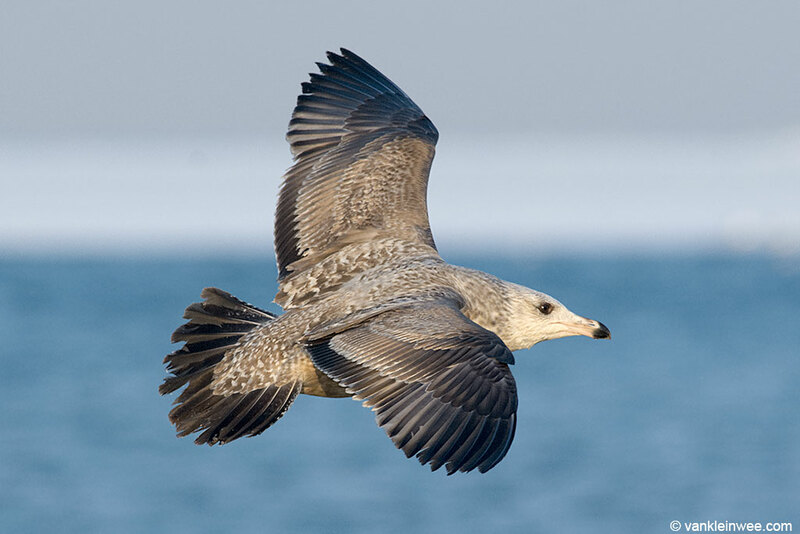 Back in July 2013, I was discussing the appearance of a European Herring Gull with fellow gull enthusiast Amar Ayyash (from Chicago) on Facebook (see this post). 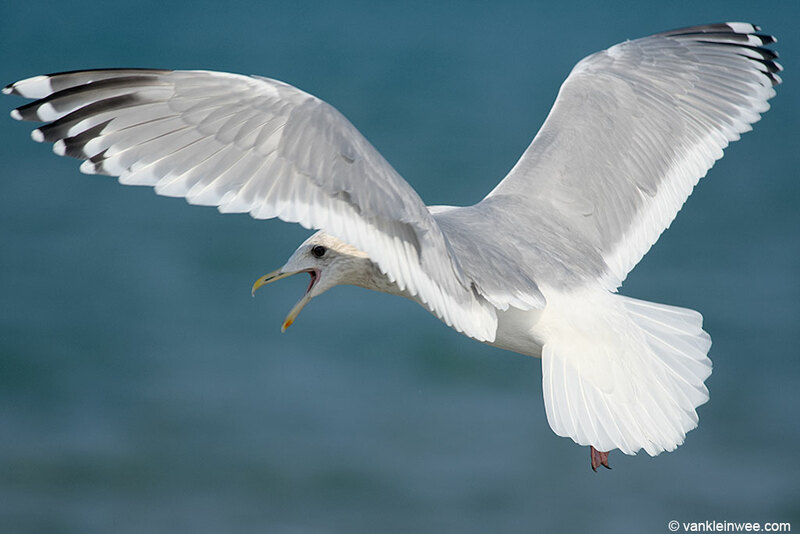 I had put up a photo that showed an adult gull in rest and Amar commented how similar to an American Herring Gull it looked. I responded that I should come over to the States to see that for myself after which Amar suggested that if I was going to do that, that I should do so during the winter. I later found out that each third Saturday of February, the Illinois Ornithological Society holds the annual Gull Frolic, an event during which some 150 birders come together at the North Point Marina north of Chicago to enjoy the local gulls that are attracted with bread for close up views. All this in a setting of friendly people, good food and a great location for taking photos. That sounded like a good event to be part of and a good opportunity to combine it with a short gull watching trip in the Lake Michigan area around Chicago and Milwaukee. So with the help of Amar who gave me valuable information about which gull locations to visit, plans were made and on Wednesday 12 February I was heading for Chicago for a 9-day trip. 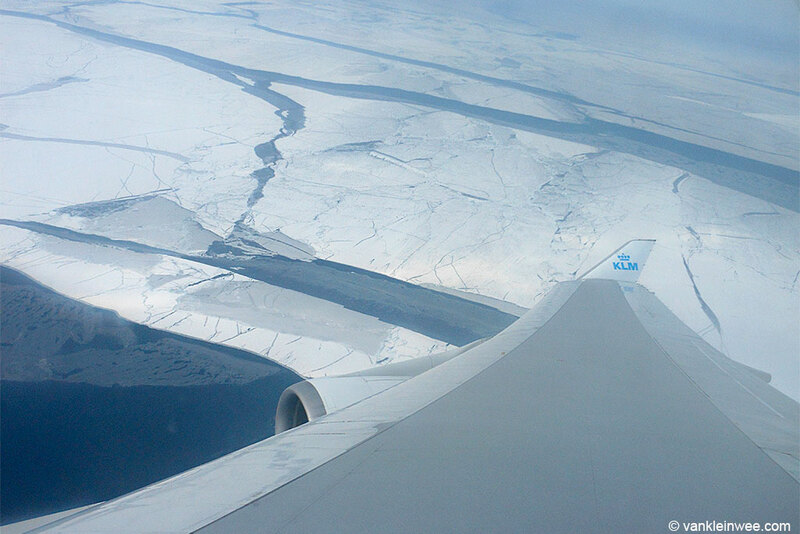 Flying over ice covered Lake Michigan. 12 February 2014. And as usual with gulls, there were a few individuals that were tricky to identify. I have obviously taken a huge number of photos that I will have to go through, but here are the ones that I like best. 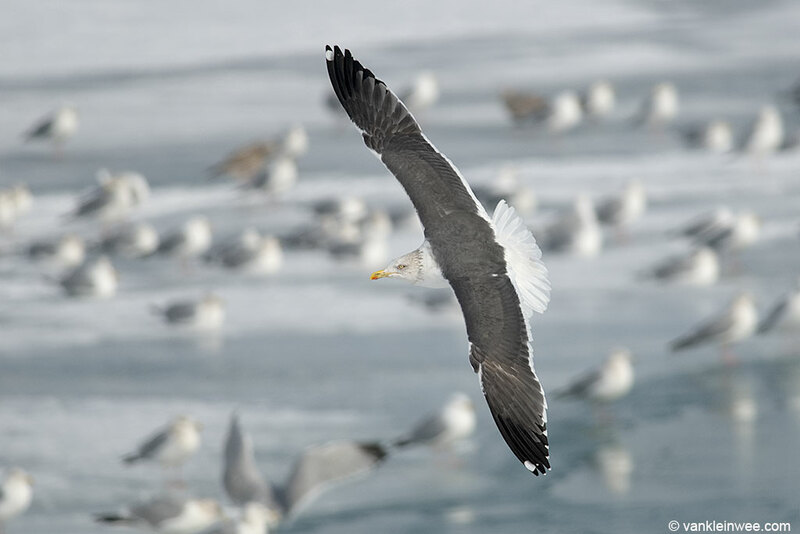 There is no other gull to open with than the Slaty-backed gull that Amar and I discovered on Friday, February 14 at the Lake County Fairgrounds in Libertyville. The full story is described here, but in short this is a mega-rarity for Illinois and a gull that I never anticipated to see (certainly not on this trip). 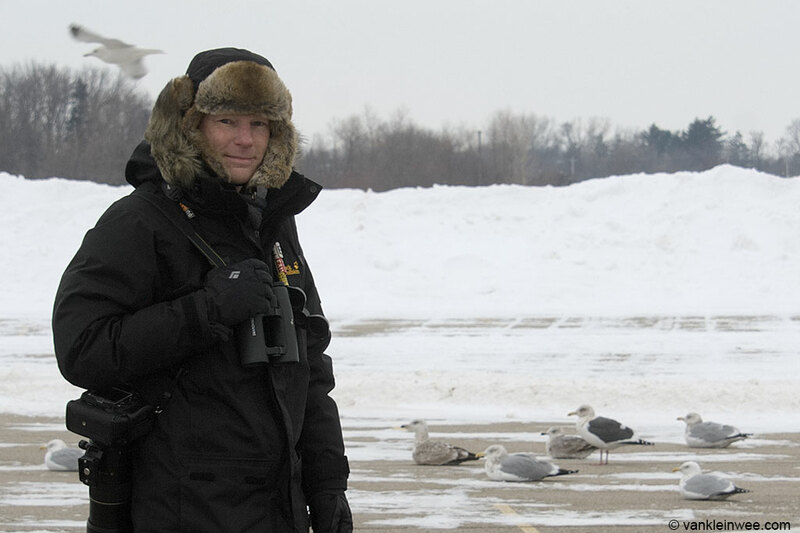 And I couldn’t resist to get all touristy and have my photo taken (by Amar) together with the Slaty-backed Gull (and yes: Illinois in February is cold!). 15 February 2014, Winthrop Harbor, Illinois, USA. Another gull that I had been wanting to see for quite some time (because of their beautiful primary pattern in adult plumage) is the Thayer’s Gull. They were present in low numbers (as expected) but some of them gave good views. 16 February 2014, BP Whiting refinery, Indiana, USA. 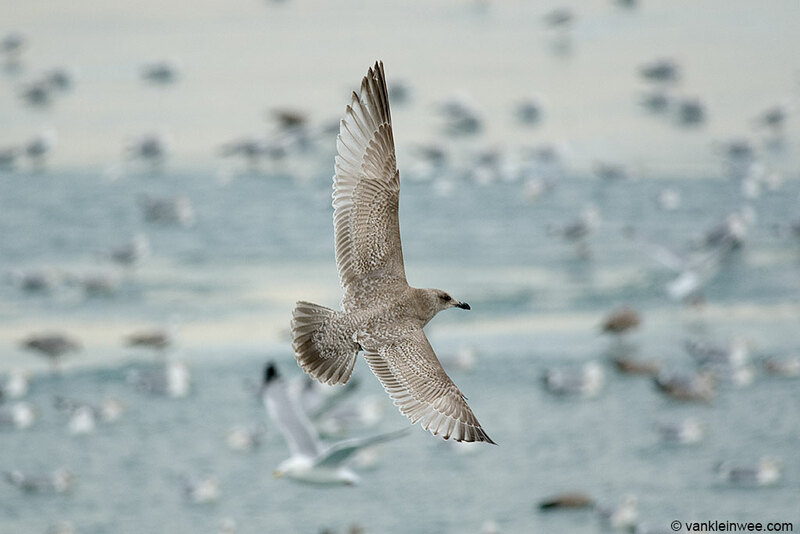 Adult Thayer’s Gull in basic plumage, showing the distinct Thayeri pattern in primary P9. 15 February 2014, North Point Marina, Winthrop Harbor, Illinois, USA. Second-calendar year Thayer’s Gull. 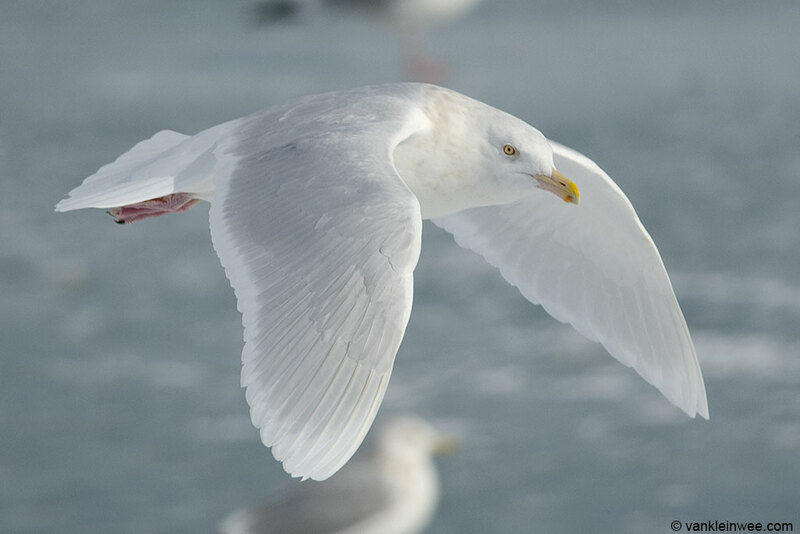 Seeing Iceland Gulls in the Lake Michigan area is interesting because they are treated by default as subspecies Larus glaucoides kumlieni, which is different from the nominate L. g. glaucoides that we get over here in the Netherlands. 16 February 2014, BP Whiting refinery, Indiana, USA. 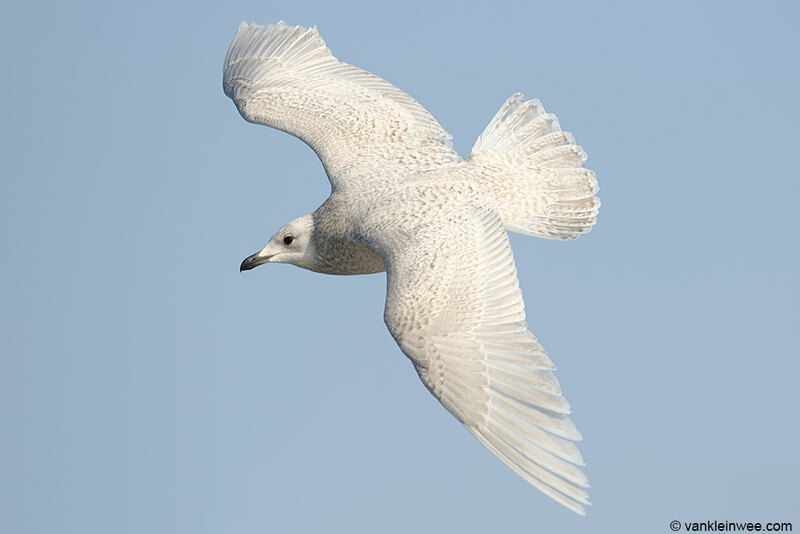 Second-calendar year Iceland Gull. Obviously abundant, I got to see all ages of American Herring Gull and their various plumages. 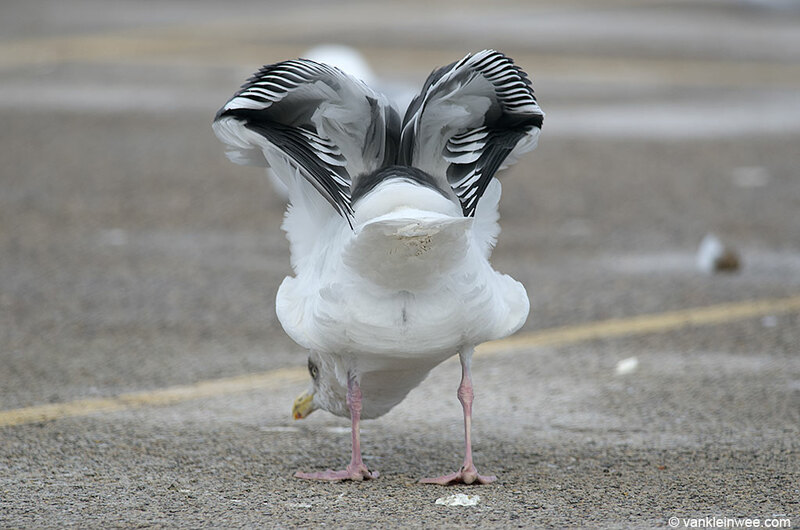 It is one thing reading about the differences with European Herring Gulls, but seeing it for yourself is quite an eye opener. I will write up a detailed post soon about what differences struck me the most. 13 February 2014, BP Whiting refinery, Indiana, USA. A second-calendar year American Herring Gull showing the distinctive dark tail that we as European birders love to see in these birds. It was very strange to see Lesser Black-backed Gulls in the USA; it is a species that I very much associate with Europe. I saw a handful of individuals, all adults apart from one 4th-calendar year type. Plumage wise, they looked similar to the ones I see in the Netherlands. 15 February 2014, North Point Marina, Winthrop Harbor, Illinois, USA. Adult Lesser Black-backed Gull in basic plumage. This abundant gull may not be the most interesting because of its lack of plumage variation, but it is a species that I wanted to become familiar with in case I should come across one in the Netherlands. Ring-billed Gull was the first gull that I saw up close during my trip and I had a nice photo session on my first day of gull watching near the BP oil refinery. 13 February 2014, BP oil refinery, Whiting, Indiana, USA. Adult Ring-billed Gull in basic plumage. During my trip I stayed in Mount Prospect, Chicago, Illinois for the first 5 days and in Wauwatosa, Milwaukee, Michigan for the remaining 4 days. 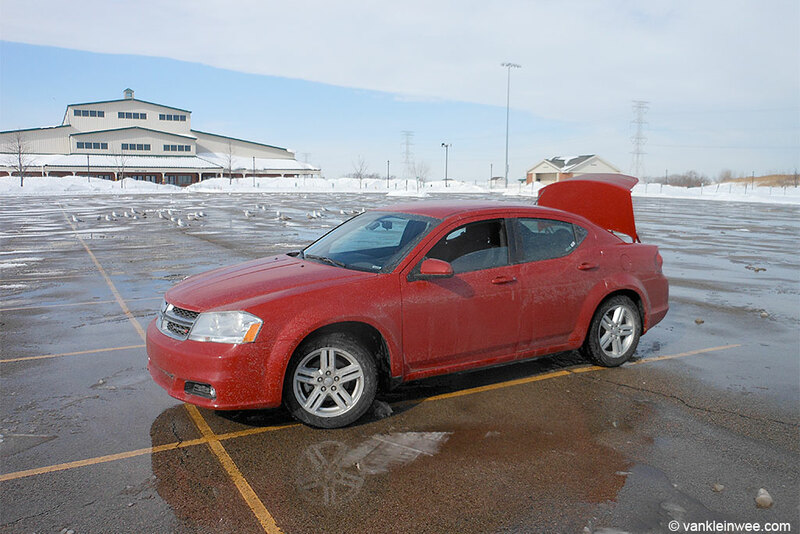 A Dodge Avenger acted as my mobile headquarters. In the background a group of Herring Gulls and Ring-billed Gulls. Lake County Fairground, Libertyville, Illinois. 18 February 2014. 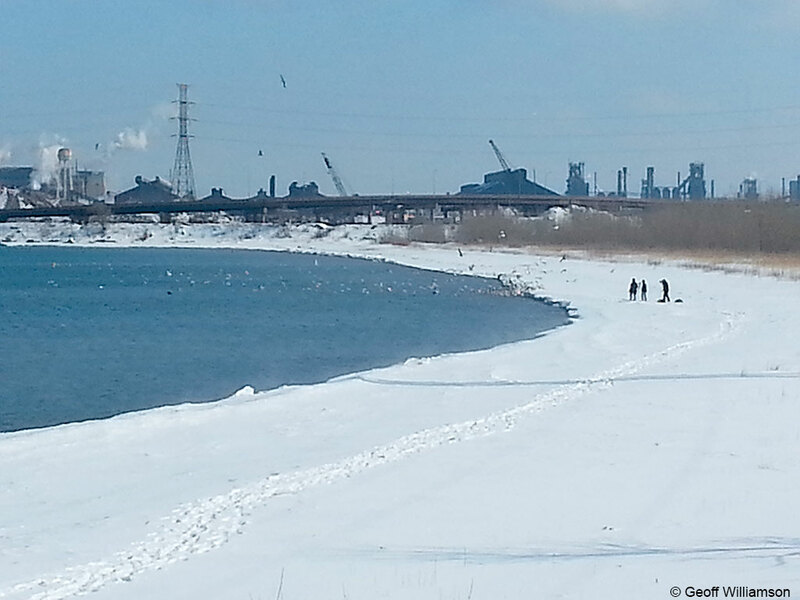 With Lake Michigan covered with ice for about 85% during my stay, the open water next to the BP oil refinery attracted a group of a few hundred gulls on a daily basis. Because it was a secluded spot with the sun coming from behind, it was an excellent spot for observing gulls. I visited it on Thursday afternoon and for most of the day on Sunday with excellent results. Ring-billed Gulls at the beach of the BP oil refinery, looking North. Gull watching takes you to the most beautiful places… 13 February 2014. On the beach of the BP oil refinery, looking South. From left to right: Amar Ayyash, Matthew Winks and myself. 16 February 2014. 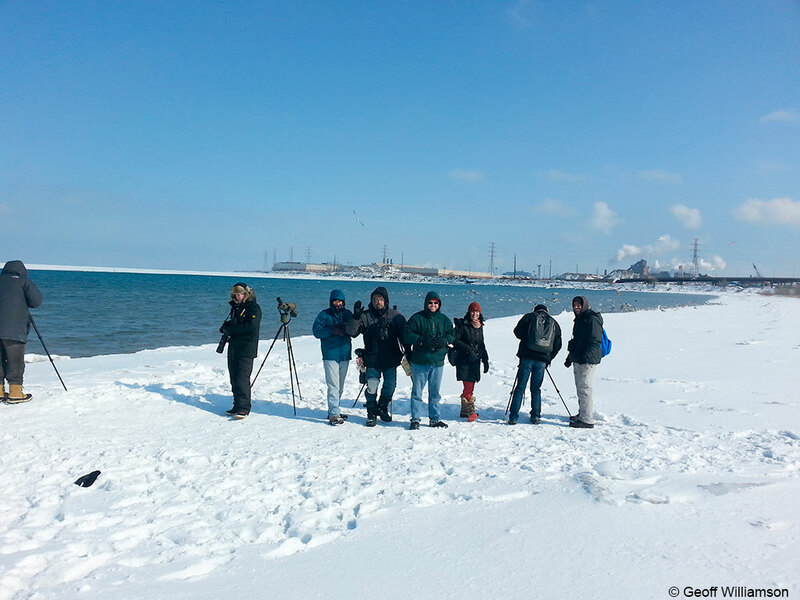 At the beach of the BP oil refinery with birders from the Illinois Ornithological Society. I’m the second from the left, fourth from the left is Amar Ayyash. 16 February 2014. This harbor is where the Gull Frolic was held and it fortunately held open water which assured the presence of a variety of ducks, geese and gulls. The high vantage point and the sun coming from behind in the afternoon made it a great spot for taking photos. View of the harbor at the end of the Gull Frolic. 15 February 2014. 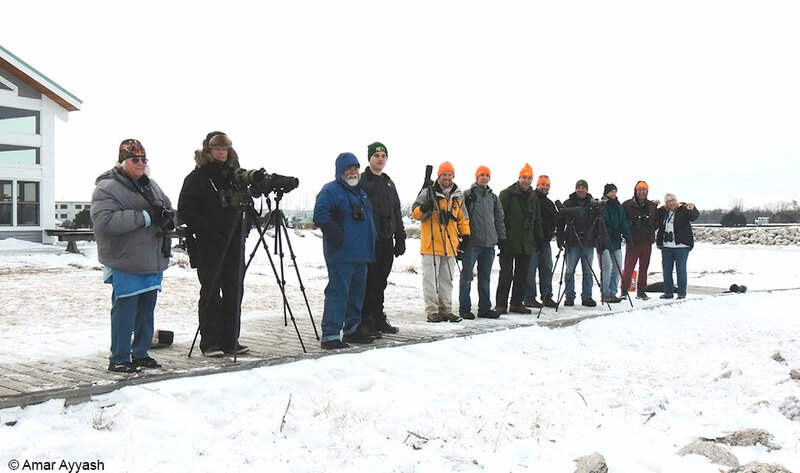 The hard-core birders who stayed the full day of the Gull Frolic and who were rewarded with seeing the Slaty-backed Gull. I’m the second from the left. North Point Marina, 15 February 2014. 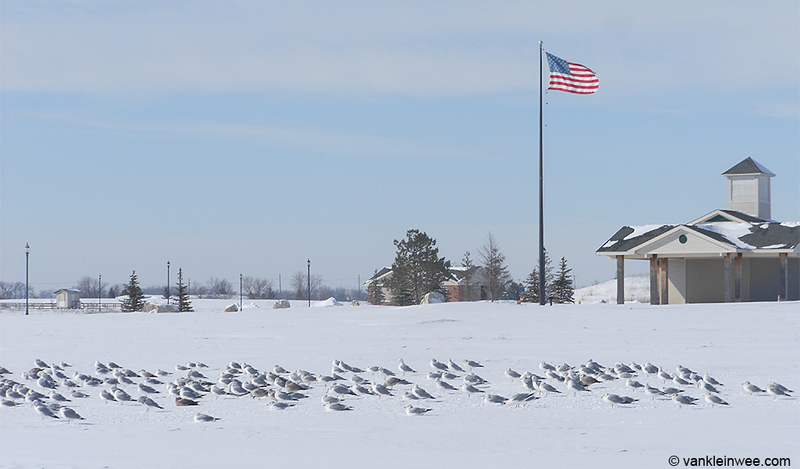 Located next to a landfill, the parking lot of the Lake County Fairground is where the gulls congregate to rest and preen: mainly Herring and Ring-billed Gulls but also the occasional Thayers, Kumliens, Glaucous, Great Black-backed (apparently a rare visitor) and Lesser Black-backed Gulls. The first visit on Friday resulted in a Slaty-backed Gull (!) and while a follow-up visit on Tuesday provided fewer numbers, any day on which you can see Glaucous and Thayers Gulls is a good day in my book. Other locations that I visited but without seeing many gulls (because the location was inaccessible due to snow or ice, because of bad lighting conditions, or simple because of low numbers of gulls) where the Hammond Marina (Chicago), McKinley Marina (Milwaukee), Veteran’s Park (Milwaukee), Kohl’s and Menards parking lot (Johnson Creek), North Point Park (Sheboygan), North Pier (Sheboygan), and Broughton Drive (Sheboygan). I initially planned to also visit Michigan and New Buffalo to the south-west of Chicago but that fell through because of bad weather (heavy snow kept me indoors for a full day). Although the 2nd half of the trip turned out to be a bit disappointing due to low numbers of gulls, the first half more than made up for it especially with the sighting of the Slaty-backed Gull and the way the photos of it turned out. From a gull watching point of view I have learned a lot about the species that I came over for, and from a personal standpoint the experience of making the trip all by myself was very valuable. 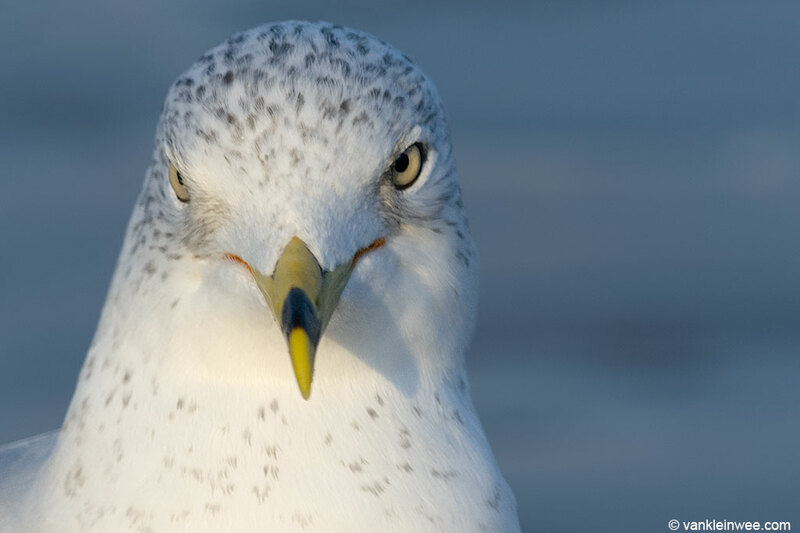 I can highly recommend visiting the USA to watch gulls (but be sure to check the best spots with the local birders) and I can definitely see myself visiting that country for more trips in the future. 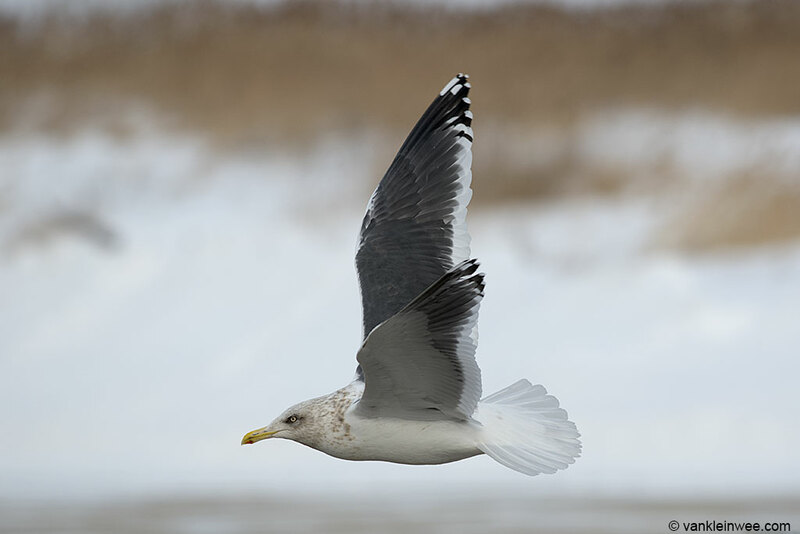 You can find all details here: http://www.illinoisbirds.org/17th-annual-gull-frolic/.